Attention Proud Parents: Announce the birth of your new born with this beautiful knit keepsake! 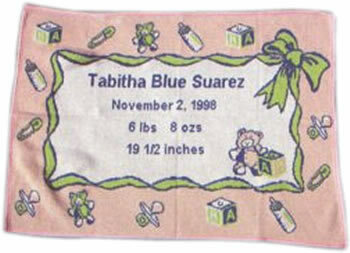 Baby Throw is made from the same quality fabric you have come to expect from our PhotoThrowTM but in PASTEL color! Whether it's a boy or girl, just choose the design and it will be knit with the child's info. A beautiful announcement can be turned into a knit that customers will proudly display for all to see.